Greeting the 2019, J88poker has changed its online tournament schedule significantly. In return for the love of users, J88poker has increased the guarantee of several tournaments. J88poker has added tournaments which with very low buy-in. J88poker has also added satellites to the J88PT Taiwan offline tournament which will be held from March 29, 2019. The new tournament schedule will be applicable from February 1st. 3. 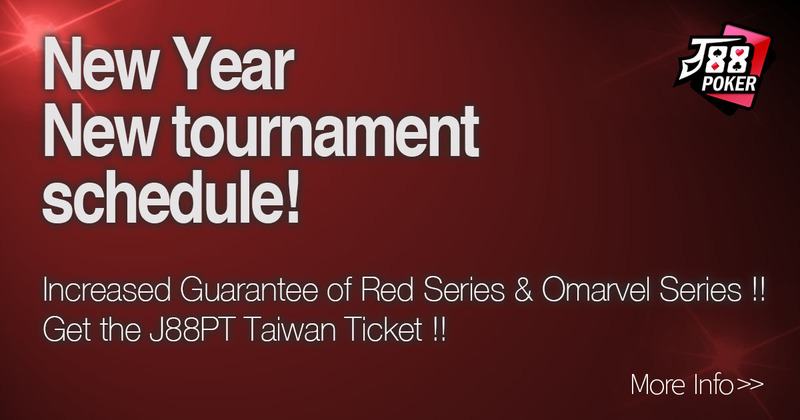 The freerolls and satellites about J88PT Taiwan offline tournament have been added. Caution: The tickets which obtained from ‘[J88PT Taiwan Freeroll] ₵1,100X3 Ticket GTD’ are only available in ‘[J88PT Taiwan Qulifier] 9,000 1Ticket GTD’ satellites. 4. Now you can participate in tournaments only with ₵20! J88poker has added various of small buy-in tournaments and also changed the minimum number of players to only two. Starting chips are also increased from 2,500 to 5,000. 5. Add Golden Dragon Hold’em & Six Plus Holdem to ‘micro tournaments and freerolls. The release of “Golden Dragon Hold’em” and “Six Plus Hold’em” last year has garnered popularity from users. For the fun of the tournaments, J88poker has added Golden Dragon Hold’em and Six Plus Hold’em to freerolls and micro tournaments. You guys can meet them every day. For the detailed schedule, please refer to our homepage.